The life and career of Dominka Janigová (28) has been influenced by several factors. First, as a five-year-old girl she lived for some time in Paris with her father, professor of mathematics at the Sorbonne. Second, at high school she met “her artist” Ondra Pivec, a jazz musician playing on the Hammond organ, and today she is his manager. 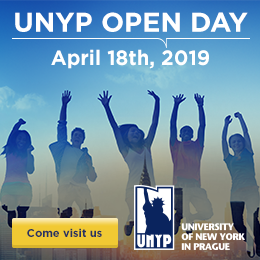 And third, her decision to study a Bachelor of Communication and Mass Media, and and then a Master of Business Communications and PR, at UNYP. “Studying at UNYP was very inspiring. Students themselves are responsible for what they take from the school. If you want something and you are open-minded, the school will support you to reach for it,” Dominika explains. And she did achieve what she wanted. Since graduation she is devoted to her work as booking agent, promoter and manager for musicians. One of her biggest successes, she considers, was fulfilling Ondra’s dream and getting him to New York, where he is now well established. It was a learning process for her.